I'm dusting off the mantel for Mantel Monday and more fun parties in Blog land. Work in Progress~ First I started with a natural theme. It worked out for the first couple of weeks in September. The antique clock is great for general mantel use. But Fall is different. The old books are interesting and my little ducks are cute but just not exactly my inspiration. This old clock has been in our family for many years. Some antique plates and Red Poppies plus some pheasant feathers in a rustic pitcher seemed to get closer to my vision. 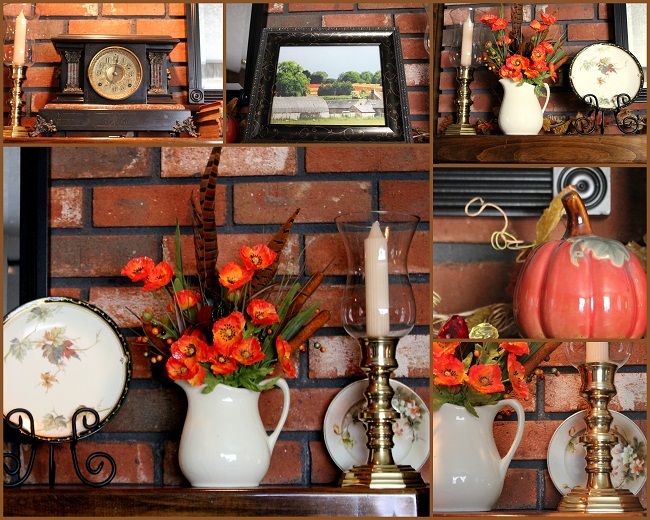 I placed some fall garland across the mantel. It needs something more. Just not the total look yet. Now I have a question. Do you keep playing with a project until it meets your level of acceptance? I have a confession! My new part-time job is at 'Tuesday Morning' and I found this frame at work. I retired from my full time job in 2007. They say after about five years seniors want to go back to work. I love to travel and work in my garden, but I love to work too. The plate stand is from 'Tuesday Morning' also. My photograph without glass covering the image. 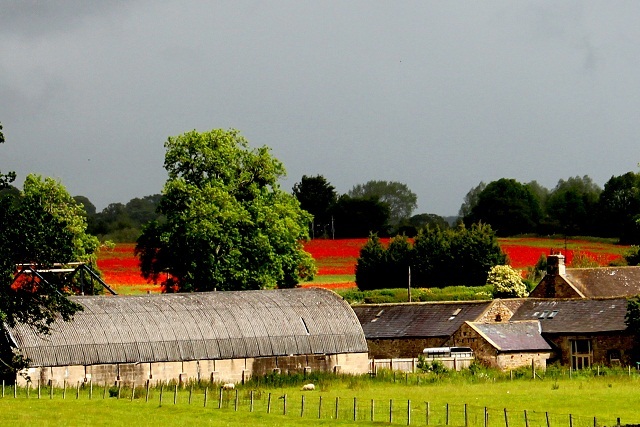 The beautiful Red Poppy fields are so incredibly beautiful. I truly hope you have enjoyed my mantel transformation. It would pay for me to go to work at Tuesday Morning, or Hobby Lobby, or Brighton...get the point? I would have to pay them to let me stay!! I bet you find LOTS of nice things that want to go home with you!! Ver pretty mantel. Love the antique clock and I think your new frame is perfect! In answer to your question: YES. I keep playing and dinking and I'm rarely ever satisfied. I love what you did with yours. The painting is just beautiful, and I love the frame from Tuesday Morning. Betty I love everything you have created for Autumn decor!! I have found some great items at Tuesday Morning as well! I have linked up with Laura's Party!